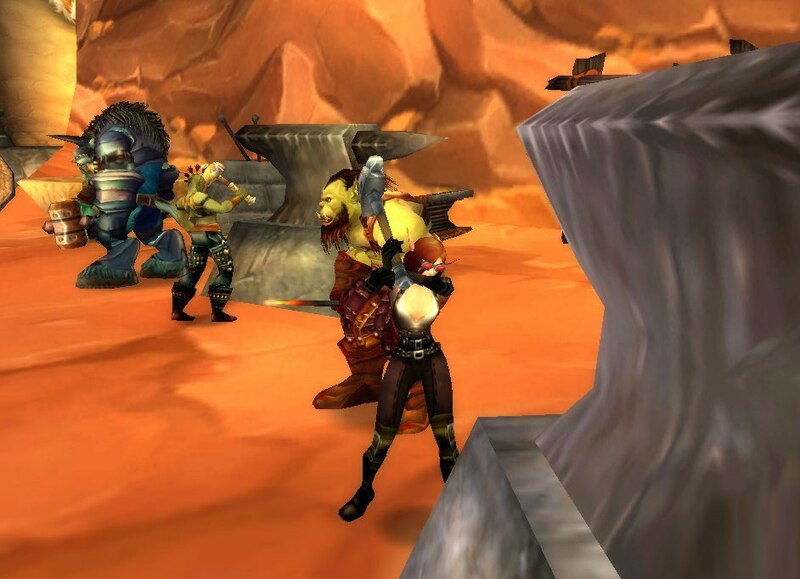 Whether your medium is cloth, leather, or metal, you are the one people turn to for stylish clothing and hearty armor. Your creative craftiness of these materials can also be shown off on you too, should one of these outfits (or one you create on your own from these ideas ^_^) suit your style. 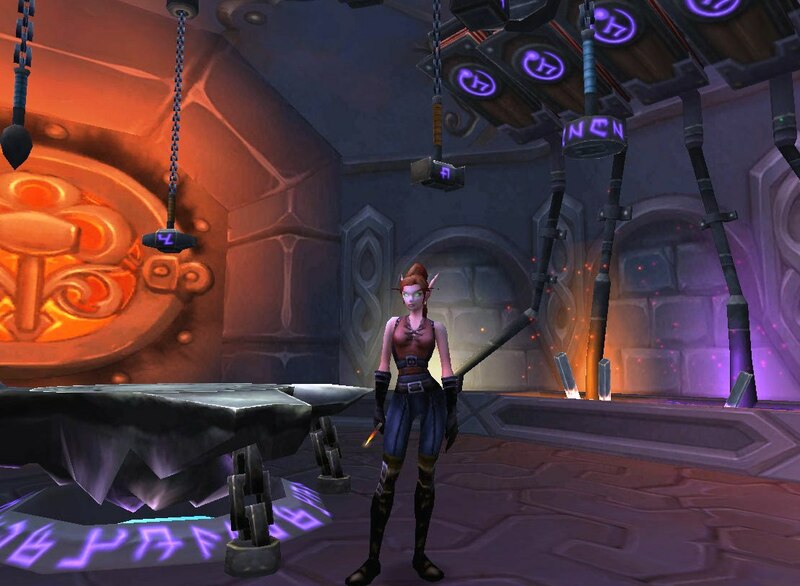 However, while other professions(like cooking and engineering) have a wide variety of off-hand frills and/or helms and gadgets to make whatever outfit you are wearing instantly related to that profession, having a tailoring/leather-working/blacksmithing type of outfit is rather hard to make obvious to others due to the lack of such accessories. And, even though most of the outfits I created could double for everyday general wear, posing next to profession objects around town does make them different for professional wear ^_^ . 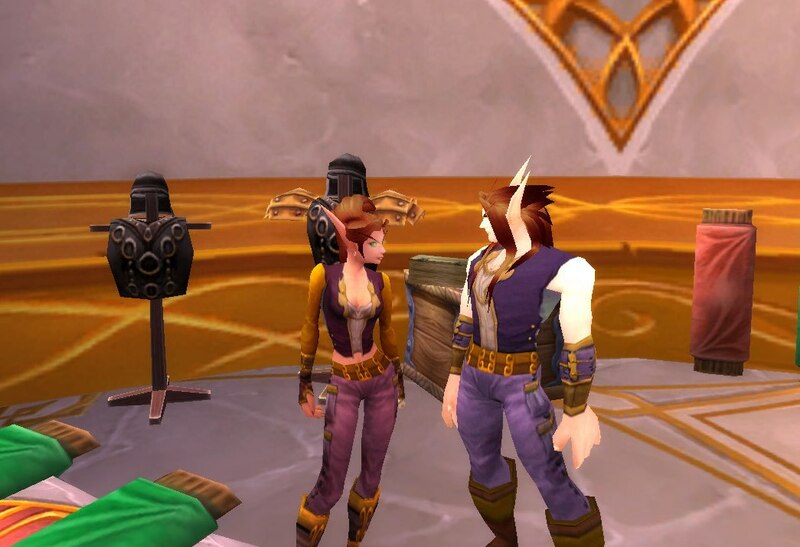 When I was wondering what to do for tailoring outfits, I looked at what the tailoring NPCs around the various towns (Horde and Alliance) wore. For the most part, their outfits are kept simple and are in plain colors. One must also stay within the realm of cloth and light leather armor to be true to what tailors actually craft; using just tailored made armor is also a great place to start from. The Canvas Set is a perfect example of what I feel is more “tailoring” like. The style and colors are simple, and the outfit just says “honest town-folk.” I added the Heavy Linen Gloves for a nice, all-brown fingerless glove (and because I could not get a hold of the Canvas Gloves ^.^). I also used the Padded Boots instead of the Canvas Shoes because the Padded Boots look more like shoes and socks than actual boots, or just plain brown shoes (like the Canvas Shoes). These can be bought from several vendors, and are a great green and brown match, should you choose to use the Canvas Set pieces. 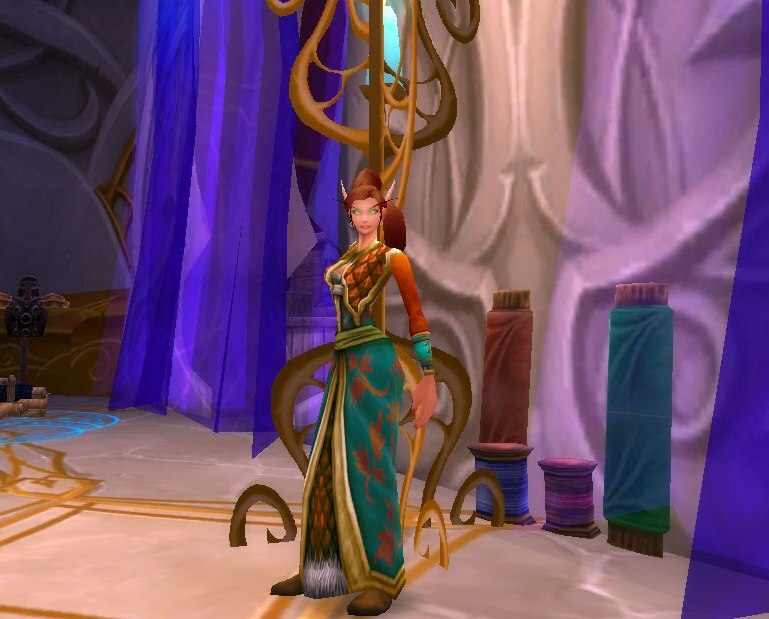 Other sets that look like this are the Brocade Set, the Cross-Stitched Set, and the vendor-bought Heavy Weave Set. The Conjurer’s Bracers are what gives the corresponding vest its nice, darker green cuffs. However, the Conjurer’s Vest looks just as lovely on its own, especially being paired up with the golden brown colors of the Gossamer pieces. The Stonemason Trousers can be switched for any other desired brown, or green, pants, as could the Walking Boots be substituted for some other footwear. The Walking Boots, however, have a nice old-English feel to them, and they add more character to the outfit. This outfit is a variation of the one before it. You won’t have to worry about finding bracers to match, as the darker cuffs on the sleeves are a part of the tunic itself. I choose not to use any boots/shoes that went over the cuff of the pants (as it looks kind of weird on female characters) and used the shoe/knee high sock combination of the Pilgrim’s Boots. 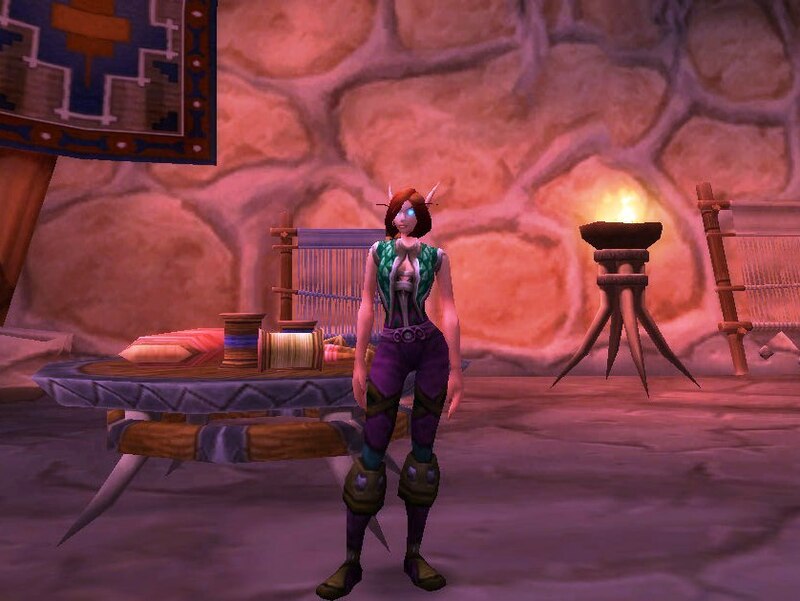 Other shoes for this type of look can be made with the Brewfest Slippers or the Padded Boots. While any other black or gray pants would go with this outfit (like the Tuxedo Pants), the embroidery on the Haliscan Pantaloons adds simple fanciness to the outfit. I used the Embroidered Gloves and Embroidered Boots to add a splash of color to the outfit while still keeping the gold highlights. This outfit is similar to what Keelen Sheets is wearing, who is also pictured in the screen shot above (just swap the Golden Filigreed Doublet for any white shirt). 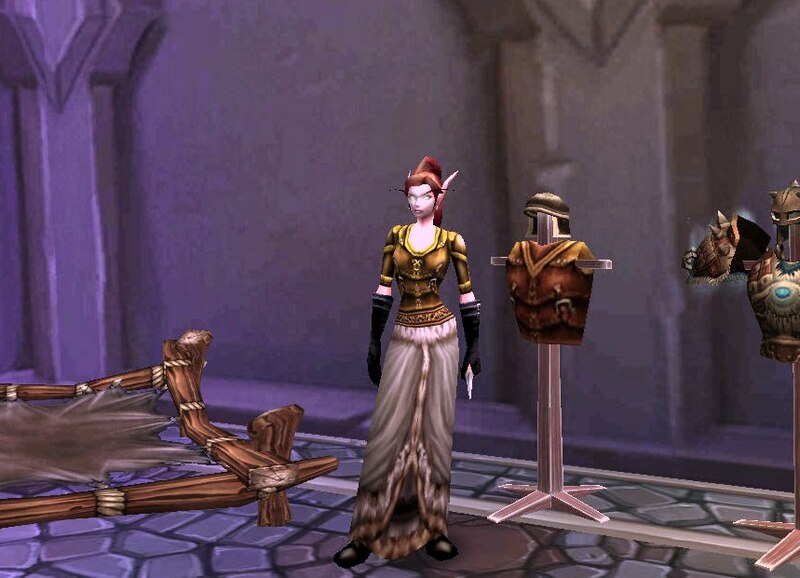 For an alternative to the Starfire pieces that are still purple, try the High Councillor’s Tunic and Pants. I used the Highborne pieces to continue the dark purple color of the vest throughout the rest of the outfit, the Wizard’s Belt adding an elegant transition between both halves. 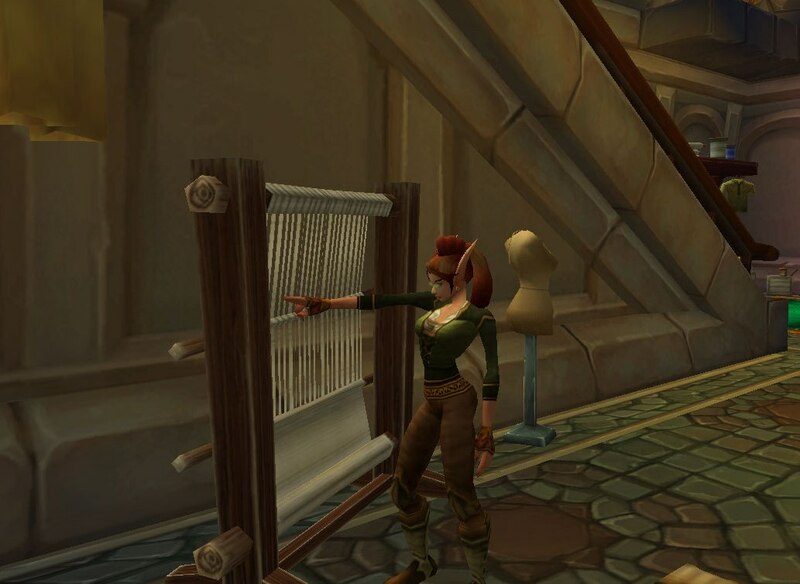 Chest-pieces like the Dreamweave Vest, in my opinion, could match to some tailors’ persona, as it includes different types of fabric all in one. The same style can be found in a full robe. Like the Dreamweave Vest, the Arcanoweave Robe includes a beautiful patterned fabrics of flowers off-set by the shiny, jewel like fabric along the chest and in the skirt; the hem of the skirt is fur-looking. It obviously took an expert tailor to masterfully bring all those elements together. I added Kirina’s Amber Filigreed Doublet to bring out the amber tones in the “jeweled fabric”, and the turquoise Arachnidian Bracelets matches the robe, as well. Other robes in this style are the Embrace of the Wind Serpent and the Robes of Volatile Power – both of which can have accessories to match. A tailoring outfit with the Tears of Heaven off-hand frill. Tailors need dyes to color their fabrics, so, I figured using a flask-like off-hand, like the Tears of Heaven, could represent the dye used. 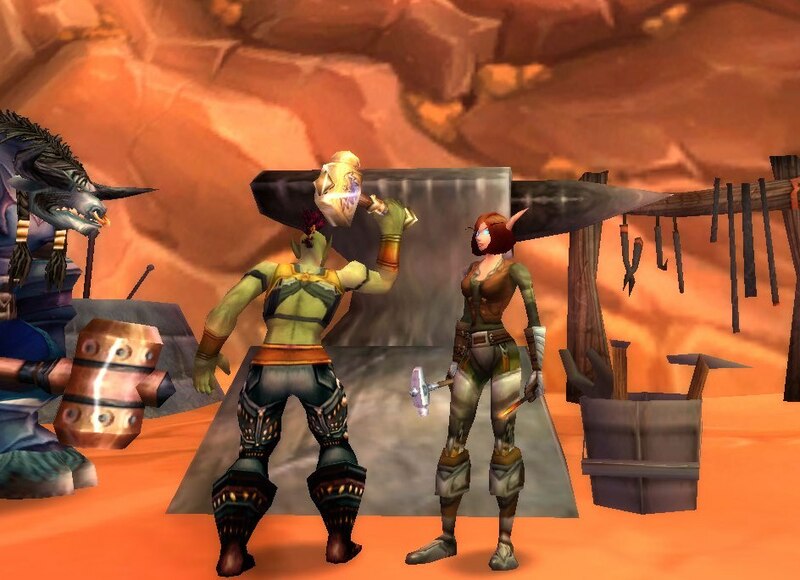 I know this seems like a stretch ^_^, but if this is something that interests you and you can’t get a hold of the off-hand I used, other alternatives could be: Flask of Forest Mojo or the Nightglow Conconction (both Horde quest rewards), or even the Tear of Grief (Alliance quest reward). Much like the tailoring outfits, it is best to stay within the realm of what leather-workers craft; so, leather and some mail armor items. I prefer these outfits to be in all leather…much more rugged that way, in my opinion. 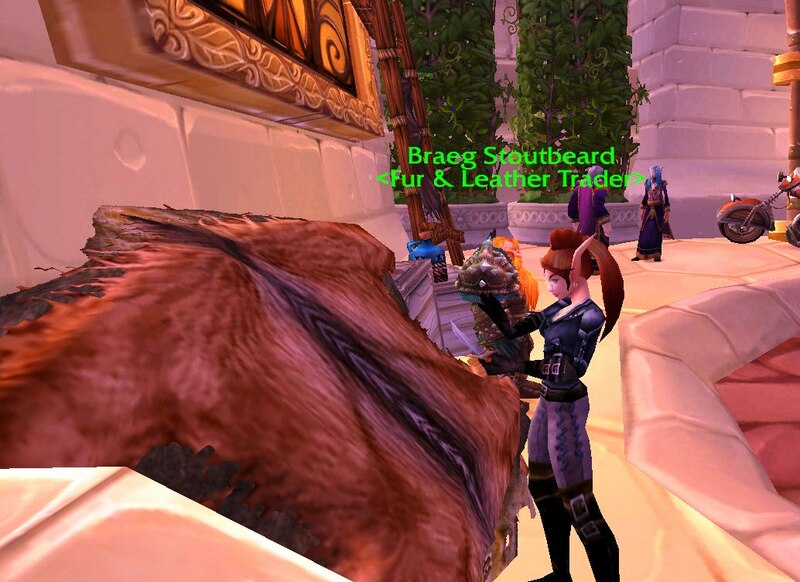 However, if including some mail items interests you, check out the Blacksmith section of this article for some ideas to go by – there are outfits there that consist of both mail and leather armor pieces. This lovely leather ensemble can act as the basis for a simple tribal leather-worker, primarily due to the armbands of the vest. Because leather-working in real life includes many harsh chemicals, I choose the sturdy, thick leather look of the Metalworking Gloves to protect the crafter; the same idea applies to the boots. The Skinning Knife is a pertinent off-hand for any of these outfits, but is more suited for a skinner’s outfit. Oh well…have to work with what you got ^_^. 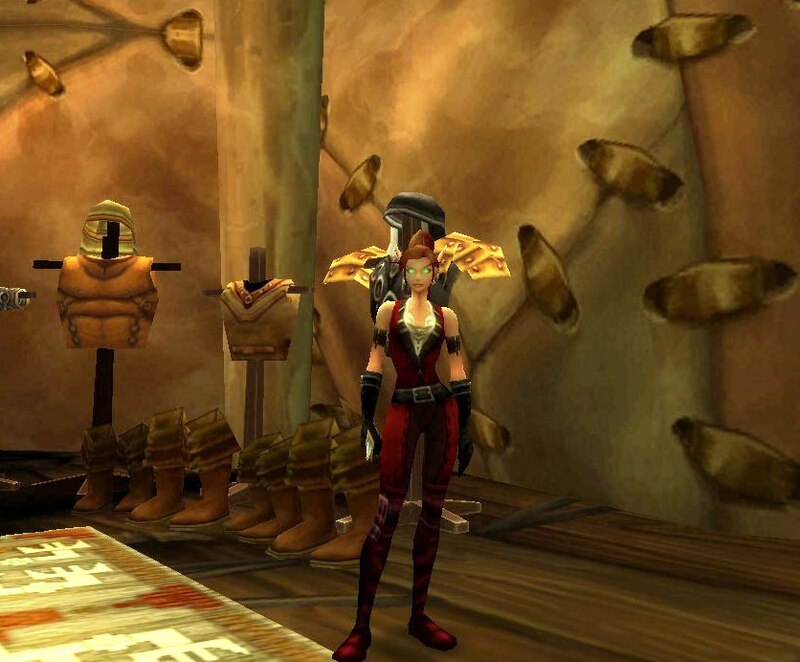 The same outfit only with the addition of the Red Defias Mask. As I stated before, with all the nasty chemicals and fumes from this profession, one could even add a face mask to this outfit to protect from the unintentional inhalation of the fumes. 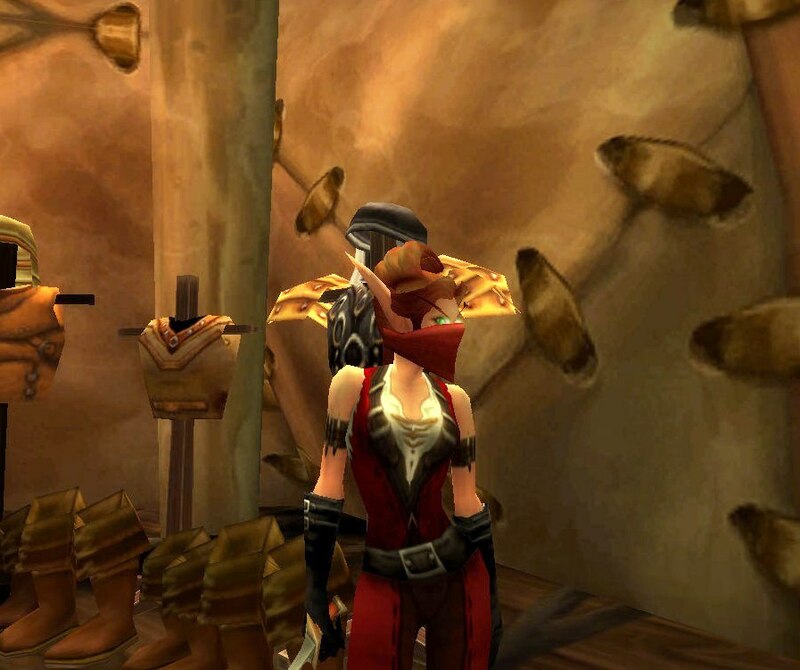 The Red Defias Mask is a rogue only mask; however, there are plenty more helms like this one to consider. For other red alternatives look for the Bloodwoven Mask or the Outlander’s Facewrap. If you just want something quick and simple, do not forget all the wonderful vendor-bought ensembles, like the Cured Leather Set. Any of the pieces in this set can be mixed and matched with other vendor bought armor, or dropped armor, for different looks. 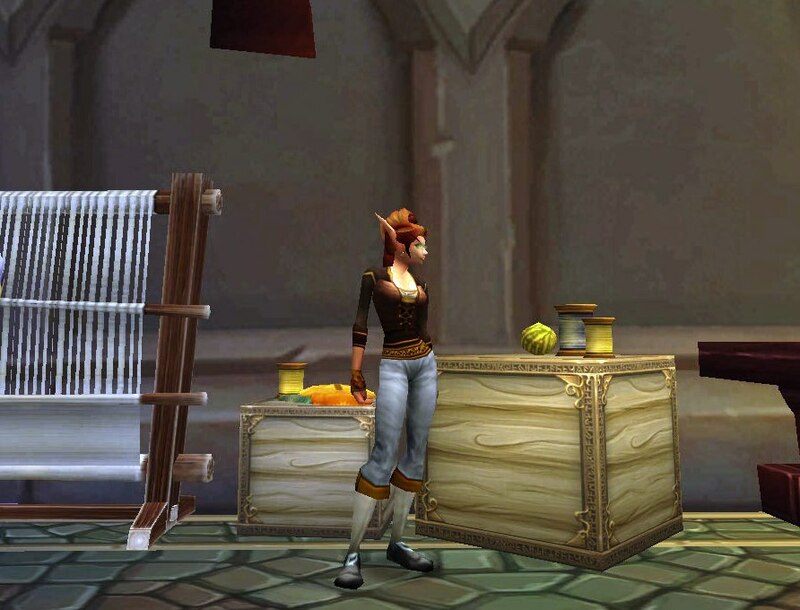 The Warped Leather Set is an effective crafter outfit that has just a hint of flare. Blue not your color? Try a full Bard’s Set (red/pink) or the Bandit Set (black/brown) for the same style. But, if you like to mix-and-match outfits, you can not go wrong with random leather pieces that somehow pull together into a great outfit. The heavier leather chest-piece, the Scouting Tunic is off-set by the lighter Inscribed Leather Pants. And, while the belt, gloves, and boots do no share a common name, they do appear to share the same leather consistency, and also the fashionable buckle. Another nice set for higher level players is the Arctic Set, as seen pictured above with Kirina, Braeg Stoutbeard. Like Kamalia, I too love the Bonechewer Set; however, I do not have too many pieces of it. No worries! Pieces from the Embroidered Set look great with it as well – the light plum color blending beautifully with the red/brown of the Bonechewer pieces. 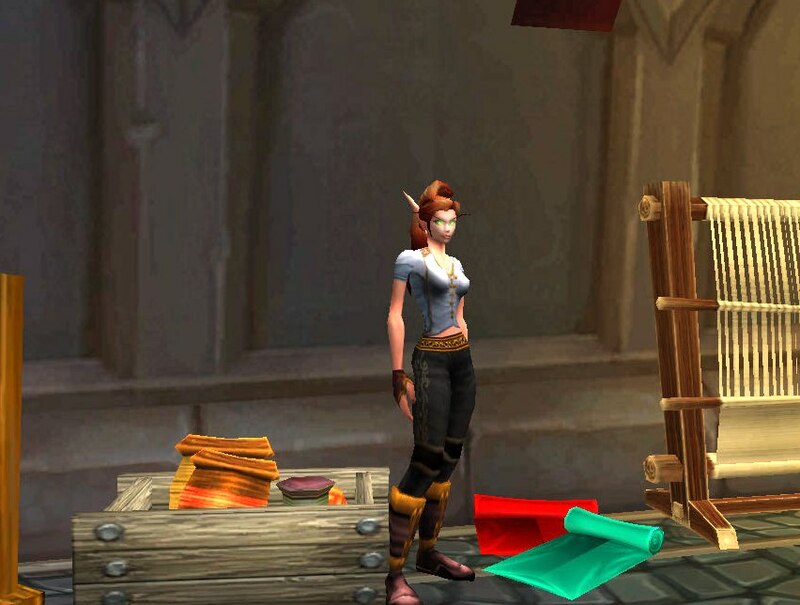 I see this outfit as a more “girly leather-working” ensemble, but I’m sure anyone will look good in it. Actually, I guess wearing a leather kilt would be more for a girly leather-worker ^_^ . 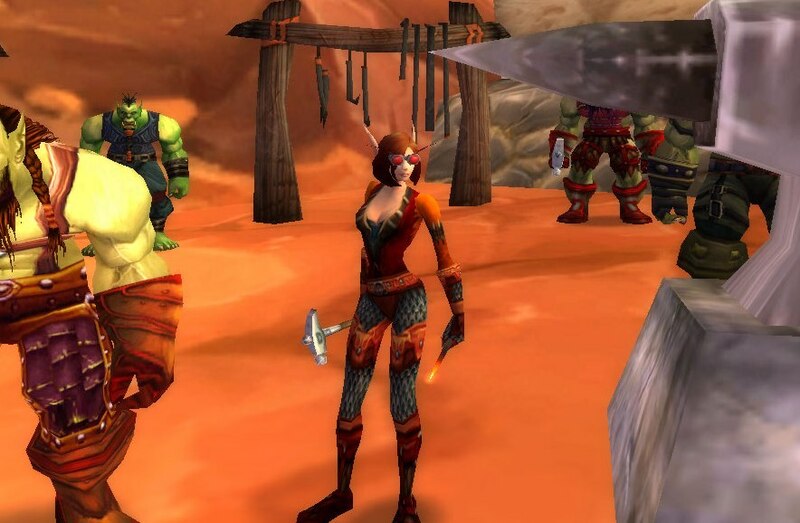 If you like this look, but hate the rarity of the Earthborn Kilt, try the Orc/Tauren shaman starter kilt – the Primitive Kilt is leather, as well! I love Kirina’s Toughened Leather Armor, and the gold coloring of this leather chest-piece goes great with belts like the Gossamer Belt. I used the same ol’ black gloves and boots to bring out the black stitching in the belt. Like the previous profession outfits this section, any blacksmith outfit that consists of mail and/or plate armor is right on target. However, I threw in a couple of leather/cloth pieces, because I’m sure no one smelts and ‘smiths in full metal armor…that would probably get pretty hot ^_^. So, I used the mail/plate armor items as more as accents, like a belt or boots, just for the blacksmith to show off what they can make. This outfit is perfect for those that are not able to wear mail/plate armor, but are a blacksmith by trade (LoL, oxymoron?). And, while it would make a great leather-working outfit, as well, what really sets it a part and makes it a blacksmithing outfit, in my opinion, is the Torturing Poker. A close-up on the Torturing Poker. 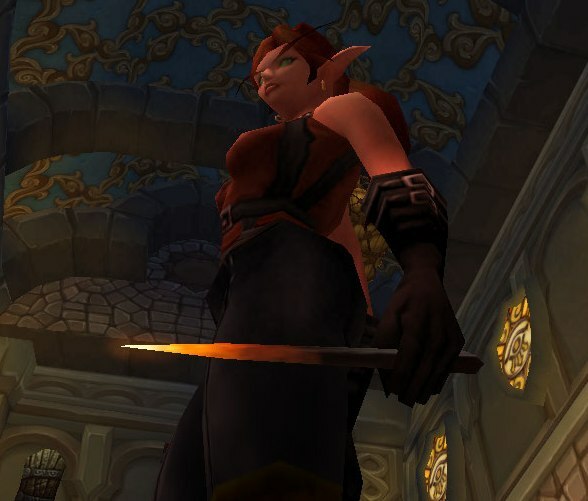 This dagger is easily farmed from Interrogator Vishas in Scarlet Monastery. This NPC is close to the entrance of the Graveyard Wing, so, that makes it so much better if you do not get the dagger on your first run (It took me 2 runs to get this). 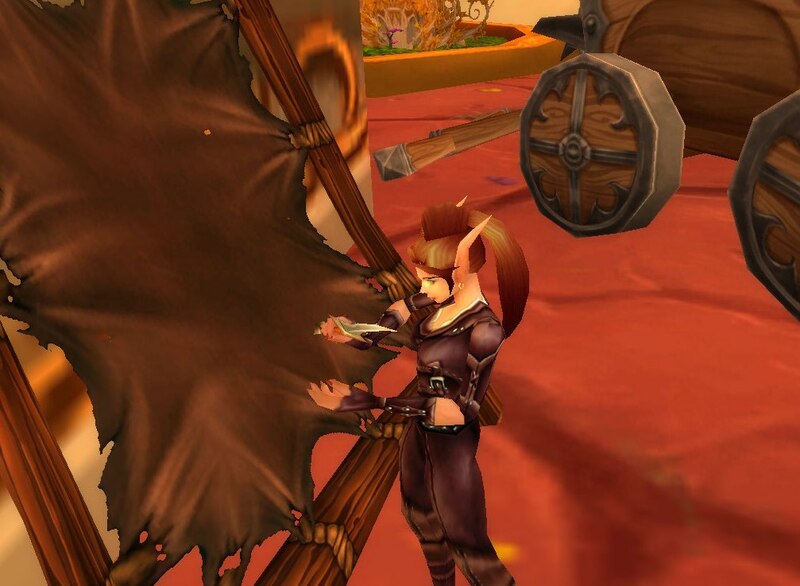 Other notable “smelting sticks” are the Flarethorn, Sporeling’s Firestick, Goblin Igniter (neutral quest reward), Rod of Molten Fire, and the Medicine Stick (neutral quest reward). This outfit is similar to the previous one, however, it includes some metal armor (the Field Plate Leggings). Both of these outfit styles can be obtained using other armor pieces (i.e. the Shadowcraft Belt looks like every other belt in-game). 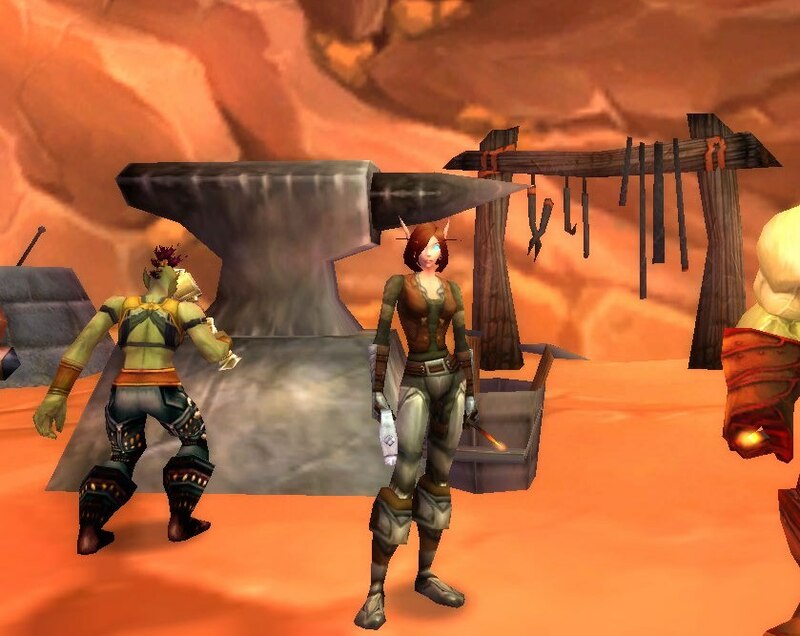 This outfit also includes another pertinent blacksmith accessory, the Blacksmith Hammer, and is a good addition to, or substitution for, weapons like the Rod of Molten Fire. 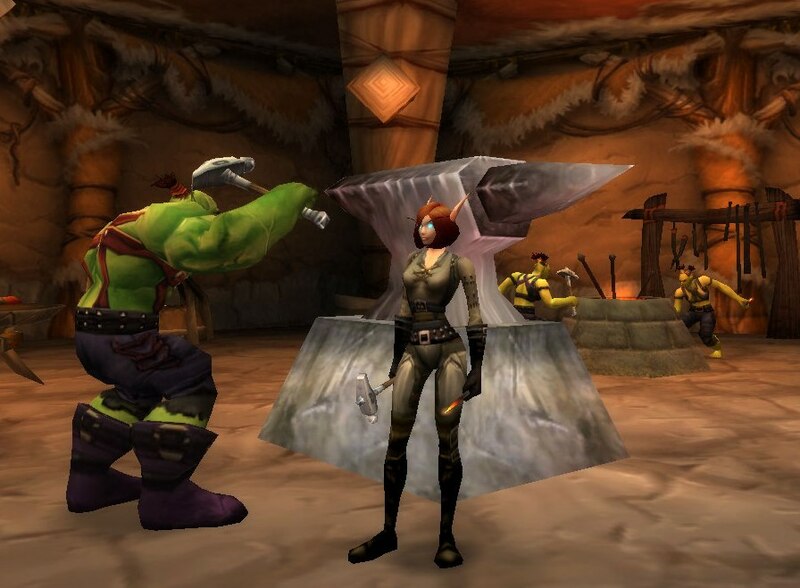 This style is also found on the pictured Orc ladies hammering around the forge with Merlaina. 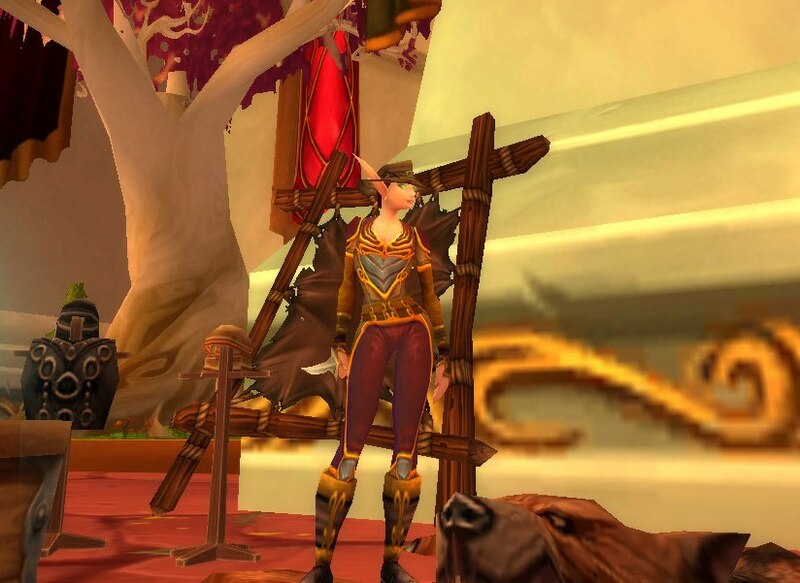 For vendor bought chest-pieces with the same style as the Grizzly Jerkin (on females), try the Battered Leather Harness (dark plum/pink), or the Buckled Harness (dark violet). The brown/black color of the Bandit Jerkin goes great with the ruddy brown color of the Nocturnal Leggings. I added Merlaina’s Rose Colored engineering goggles in the outfit for extra protection – most of the blacksmith NPCs do not wear any eye/face protection (I guess they all must be bad-asses ^_^). However, I’m sure with all the molten metal flying around while hammering out armor and weapons, something is bound to fly into your face and arms. While there is a wide variety of engineering goggles to consider, there are not too many non-engineer ones. As you may know from reading any of my other articles, the Ruby Shades (not vendor sold anymore, but still pops up on the auction houses), the Blix’s Eyesight Enhancing Romance Goggles, and the Spectrecles, are really the only “available” non engineering goggle options. 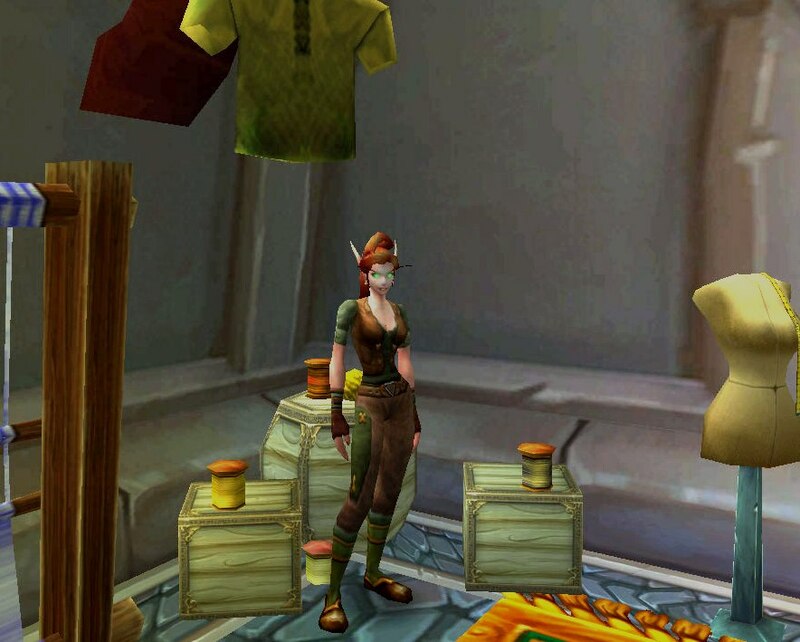 This outfit is more “village” like, and, I picture this more for Human/Dwarf/Gnome characters. The vendor bought Polished Scale pieces match perfectly with the Field Plate pieces. I also like the way the gloves are designed – they have a metal plate on the outside of the hand/wrist, but are leather on the inside; this makes them easy and safe to work with, but also shoes off that metal accent. The same outfit only with the substitution of the Field Plate Leggings for the Raptorhide Legguards. This same look can be gotten with less metal armor, as well. 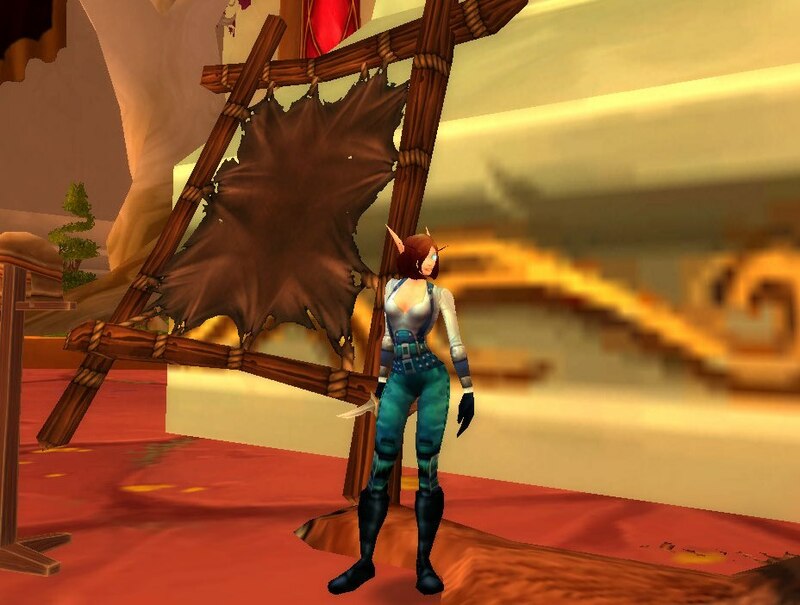 The Raptorhide Legguards (neutral quest reward), are leather pants that look like they are made of mail. While I am sure that there are other leather pants that appear the same way, these are the only ones I know of that share the same design/color scheme as the Field Plate Leggings. This last outfit is more feminine, in my opinion, but can be easily adapted to fit for both genders. The leather Imposing Vest blends in with the red portion on the mail Raider’s Legguards, giving the illusion that it is one piece divided by the correlating Raider’s Belt. The Amber Filigreed Doublet compliments the red and orange within the other pieces of the outfit, while also adding protection for the crafter’s arms. 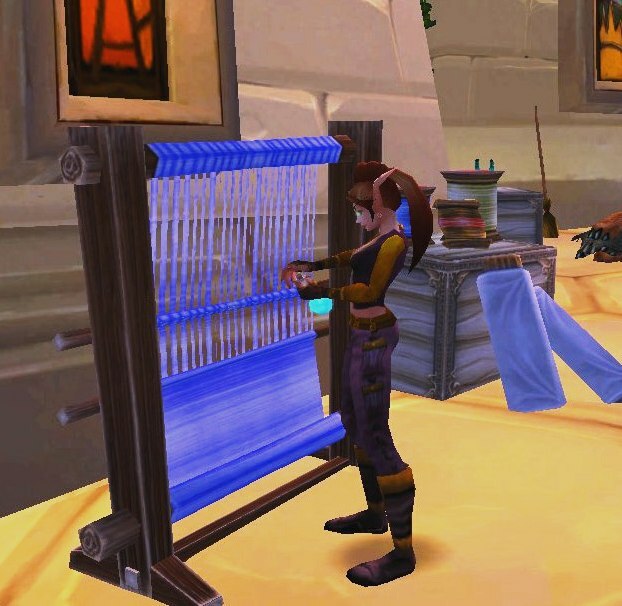 Hopefully, this article gave you some ideas on how to put together a “crafter” outfit (or outfits ^_^). I only used the clothing items I already had on, or were saving for, Kirina and Merlaina, so, I am sure that there are plenty of other combinations to be had with the tons of other gear in-game; it’s all about what you like for your character.